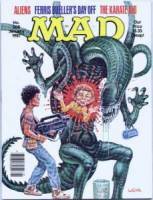 MAD Magazine was a staple of the eighties culture, and even tho has been around long before the eighties and still continues to run, in my personal opinion, the eighties were a highpoint for the magazine. (Probably due to the fact that it was then that I was at the age the magazine aims at). Nonetheless apart from The Lighter Side Of..., Spy vs. Spy and the legendary folding back covers, MAD's TV and film parodies are classic. And in January 1987 (pg 4-9), Ferris Bueller's Day Off was added to the list of films that MAD Magazine took off. It was titled Fearless Buller's Day Off and was drawn by Mort Drucker and written by Dennis Snee. Thanks to Doug Gilford and the MAD Magazine Cover Site for helping me put this feature up.